We are very happy to announce that our Team Leader Handbook has been translated into Spanish and is now available! Former Florida Conference UMVIM Coordinator Greg Harford and Director of Global Missions Icel Rodriguez provided this valuable resource for the Hispanic Community in our Jurisdiction, and all who would like to utilize it. 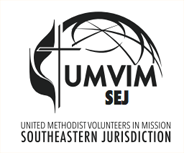 Please email sejinfo@umvim.org if you wish to receive a .pdf version of the Team Leader Handbook in Spanish.